Have you ever imagined fishing from, or camping within a plane? Meet the MVP, or Most Versatile Plane — publicly unveiled for the very first time, today at EAA AirVenture in Oshkosh, Wisconsin. 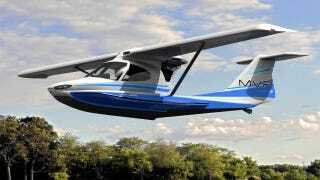 A few years from now, this imaginative private plane will be gracefully gliding onto a lake near you. It's not just a float plane. The MVP more like a giant, flying Sea-Doo. It's a flying boat, on which you can camp, fish, or just lounge around. The company says, "the MVP's most significant and game-changing quality is that it will do more than simply fly from one place to another. It will also support and play an active role in many great outdoor activities including camping, fishing, hunting, exploring, relaxing and more." Comparing this plane to the hideous Pontiac minivan/SUV of yore is not mean as an insult to the MVP. After all, at least this plane/boat is attractive, unlike the Pontiac. This is also not to be confused with the twin-engine Piper Aztec. But the MVP does have plenty of versatile features, which should draw the recreational pilot to it. The instrument panel and cockpit canopy move up and back, out of the way. The cockpit seats can be repositioned, making your cockpit like a classic bass boat. Catwalks extend along each side of the plane, useful for inspecting the plane while it's on the water, or just getting in and out of the water for swimming. There's even a custom hammock that stretches from the cockpit to the tail. Founded in 2012 and based in Minnesota, MVP.Aero is comprised of only 20 employees, who share an 85 percent stake in the company. On the design team, they've brought over Mike Van Staagen who has worked with Cirrus and Sikorsky. The program will evolve over the next 5 years, with the first aircraft offered as an Experimental Amateur-Built Kit (E-AB), followed by Experimental Light Sport Aircraft (ELSA) and finally as a Special Light Sport Aircraft (SLSA). Initially, up to 8 MVPs per month will be built. Two manufacturers have been selected for production here in the U.S. — Glasair Aviation of Arlington, Washington, and Fibercraft Inc., of Spruce Creek, Florida. Hanxing Aviation of China will be building MVPs for the Asian market. The MVP is not designed as a "flying car" a la the Terrafugia, but it will have folding wings for easy trailering and storage. By now, you're probably wondering how much they cost. CEO Steve Pugh told me they'l start out at $169,000 for the kit version, and $189,000 for the SLSA. He also told me the plane's endurance is planned for four hours. Actual flight range would depend on how much time you have it running on the water. The whole "flying car" dream is still a long way from what most of us imagine, zipping around like The Jetsons or Doc Brown's DeLorean in Back to the Future II. Today's flying cars are awkward-looking, both on the street and in the air. But I expect the MVP to be adopted more quickly, and seen more often in places like the Seaplane Base on Lake Winnebago at Oshkosh.